Keep comfortable at the game or any function with stadium bench seats with GCI Outdoors' BleacherBack! 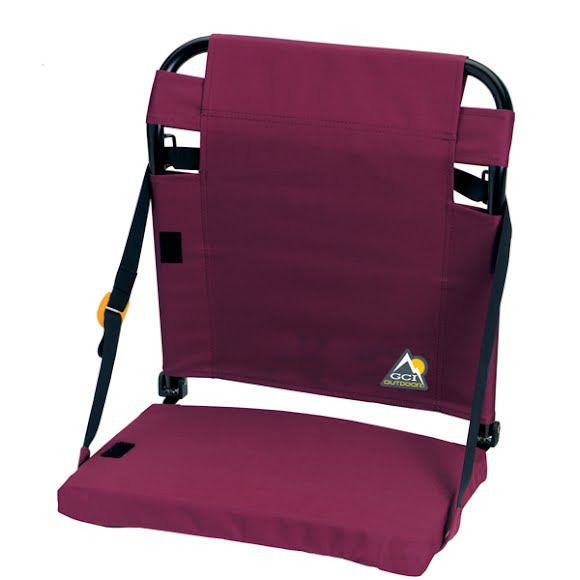 The BleacherBack stadium seat is designed to fasten to stadium benches with a simple click of a buckle. The patented BackComfort Technology adjusts the backrest to unlimited reclining positions and a shoulder strap with patented Auto-Fold Technology allows for easy opening, closing and carrying. Keep comfortable at the game or any function with stadium bench seats with GCI Outdoors&apos; BleacherBack! The BleacherBack stadium seat is designed to fasten to stadium benches with a simple click of a buckle. The patented BackComfort Technology adjusts the backrest to unlimited reclining positions and a shoulder strap with patented Auto-Fold Technology allows for easy opening, closing and carrying. Patented BackComfort Technology for a multitude of customized backrest comfort zones. Patented Auto-Fold Technology shoulder strap for easy opening, closing and carrying. Supports 250 lb (113.4 kg).